Based on observations of the demographic trends in industrial nations, a significant increase in the number of senior travelers is expected over the next decades. 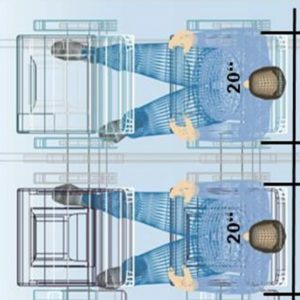 Due to their age-related functional limitations, these flyers will have demands and expectations of aircraft cabin layouts that go beyond those of younger passengers. An understanding of these physical limitations, along with the discomfort and the risk of injury they may lead to if not properly addressed, are prerequisites in the design of an accessible seating area. 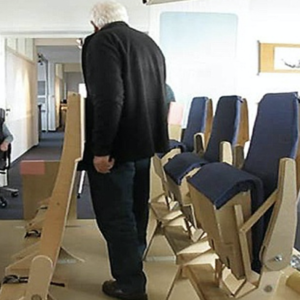 The primary aim of SII Deutschland’s (SII) research on the subject was to provide recommendations for airlines and manufacturers on how to cater for older passengers, by offering a modular design concept that takes into account all relevant ergonomic requirements. The concept was based on four major observations that have a detrimental effect on the safety and comfort of older passengers. 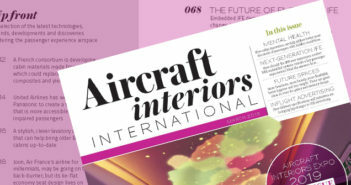 An accessible seating area should be regarded as an integral part of a well-designed aircraft cabin, providing benefits for passengers as well as operators. ‘Silver travelers’ with adequate incomes are willing to pay more money for more safety and comfort. This said, most carriers appear to ignore the facts at hand and resist the need to adapt to such demands, risking the loss of important customers to other means of transportation. • Observation: The first part of SII’s research was to investigate different possibilities for senior passengers to access the seat assigned to them in the aircraft. 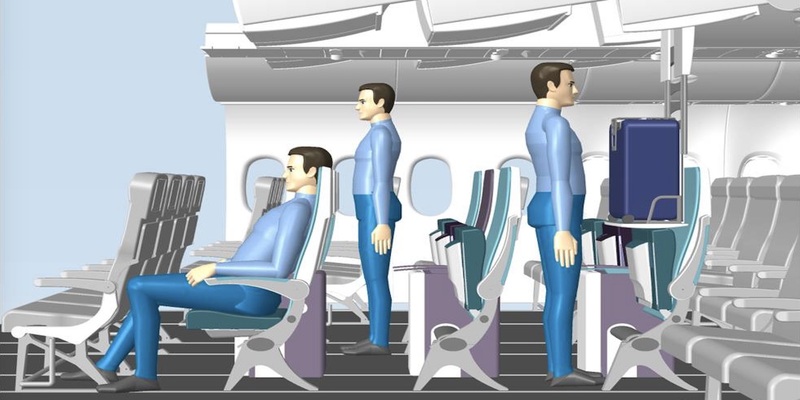 Empirical data demonstrated that standard seat pitches between 28in and 34in lead to an extremely unbalanced posture when trying to move between seat rows. Reduced muscle strength and flexibility in the joints force senior passengers to hold on the backrest of the front seat or reach out for some other means of support. Protruding seat legs represent an additional trip hazard. • Concept: The basis of an accessible seating area consists of the installation of seat rows equipped with foldable seats. If fitted with slim backrests, foldable armrests and a new leg design, foldable seats can easily fulfil the above requirements at a 33in pitch. This pitch provides sufficient legroom for 99th percentile men. In addition, reduced turnaround times can be achieved, as the number of passengers blocking the aisle area is drastically reduced while boarding the aircraft. • Observation: A detailed analysis of the movement sequence involved in the process of sitting down and standing up from a seat clearly reveals that the natural flow is severely hindered if the front seat row is installed at a standard pitch between 28in and 32in. This particularly affects senior passengers, as they have to lean forward, when their legs are bent, in order to maintain their balance. Concept: The armrests and seat pan of the foldable seat move upwards and downwards, in a synchronized fashion, allowing the occupant to fully control the movement sequence by holding on to the armrests. 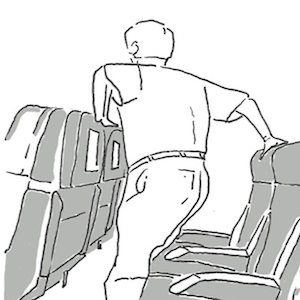 A light push of the armrest or the seat pan is sufficient to assist the movement of the passenger as they stand up. In addition, a recess in the backrest serves as an additional handgrip. 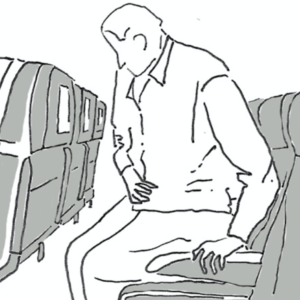 • Observation: Another important part of SII’s research consisted of studying sitting behavior during long flights. It was determined that a seat width of less than 20in makes it basically impossible to periodically vary and /or adjust the sitting position, leading to back and leg stiffness or pain, and even a significant risk of thrombosis in senior passengers. • Concept: SII’s holistic approach to an accessible seating area includes a seat width of 20in, along with individual armrests for each seat which, in combination with the 33in seat pitch referenced above, provides adequate space to satisfy this requirement. Consequently, the concept is hinged around a triple center-seat layout design, rather than quadruple. 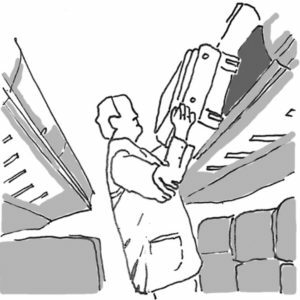 • Observation: The process of stowing and removing hand luggage was another central point of the study. 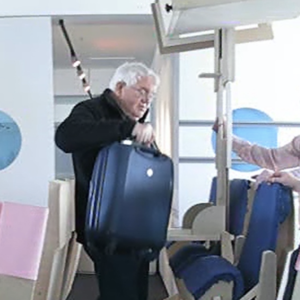 Who hasn’t helped an elderly person lift or lower a bag from a conventional overhead compartment, placed so high that it is often even unreachable – particularly for female travelers? • Concept: The introduction of transversal stowage compartments completes SII’s concept of an accessible seating area. These compartments can be easily retrofitted in a standard cabin configuration, without affecting the central Passenger Service Units, with two of them mounted directly above the outer seats, and a third mounted on the floor between one of the outer seats and the middle seat. Electrically-driven hatches make the access as well as the stowage and removal of hand luggage effortless. 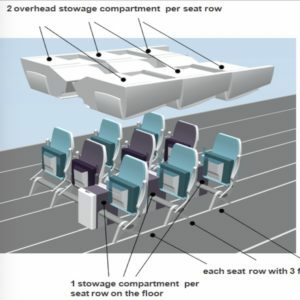 Seat rows consisting of foldable seats, combined with a slightly increased seat pitch and seat width, form the basis for easy access and comfortable seating on long-haul routes. Transversally accessible stowage compartments above and adjacent to the seats complete the concept. This approach allows an efficient use of the available cabin space while offering the key features sought by senior passengers who are willing to pay a small premium for their ticket. 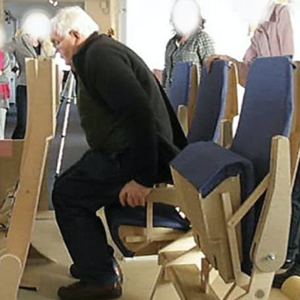 The accessible seating area is designed for and can be easily retrofitted in any widebody aircraft. The size of the area ( i.e. the number of seat rows) can be matched to the individual needs of each airline, without affecting the rest of the cabin configuration. The project was supported by the BMWi (the German federal ministry of economy and energy) within the German ‘LuFo IV-4’ aeronautical research program.